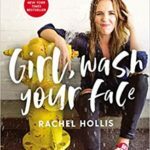 So, I stumbled across Rachel Hollis when I found a bunch of unused credits in my Audible account. Her book, Girl, Wash Your Face sounded interesting and had a lot of good reviews, so I downloaded it and started listening to it on my walks last spring. 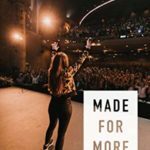 It just celebrated its 1-year anniversary and has been the catalyst for Rachel’s rise to the top of the inspirational/motivational speaker/writer circuit. In the book, Rachel gets really real and is an engaging storyteller – but it’s her voice that drew me in (and I’m not a auditory learner) and the fact that I felt like she was sitting on the couch with me, talking with me, not reading her book to me. 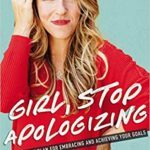 And her next book, Girl, Stop Apologizing is available for pre-order (Chloe actually pre-ordered it for me for my birthday since it comes out next month, which is my birthday month ;-)) right now too. Pre-order here (there’s a cool bonus when you pre-order too). Note: Those are my Amazon Influencer links, so I may receive a tiny (and I mean tiny ;-)) commission if you purchase through my links. That said, I never recommend anything I haven’t purchased and loved myself.